It's so exciting to see how many people have participated in the #skipthebag challenge. 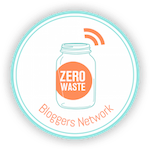 Keep up the great work by refusing plastic bags! I've had many people say that they already routinely use reusable bags while shopping. So I'd like to extend level two and level three challenges to them. purchase I may get a commission, but the price to you remains unchanged. Level two #skipthebag is using reusable produce bags. I recently purchased some produce bags and I love them! Mine fold in quarters and have a draw sting bag closure. I consider it a more advanced level because it would be silly to use reusable produce bags and then put them in a plastic bag. Especially if you are purchasing a lot of fresh fruit and vegetables, using reusable produce bags can save a lot of plastic! 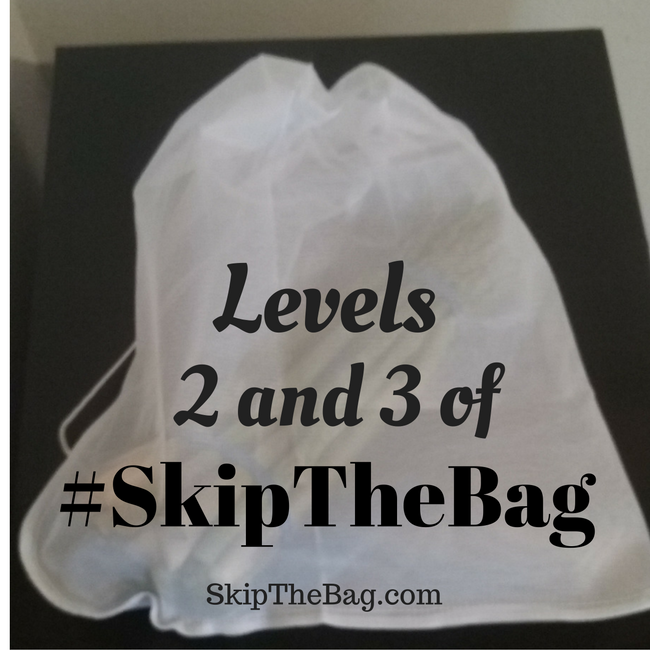 Level 3 of #skipthebag is using reusable bags or glass containers to buy bulk food. This is one I'm still working on. I've got a fair collection of glass bottles, but I do not have any reusable bags. I love that this one has a zipper, but I also love that this bag spells out what it is for and has great reviews. Unfortunately part of the reason why I tried to reach for level three is that I haven't found many stores that sell bulk food. Or at least ones that sell bulk food that we actually want. Most stores I've found that sell any bulk food, sell candy or nuts or other treats that we just don't eat. I'd love to find baking ingredients, lentils and spices! I haven't given up though, there are still some specialty and 'ethnic' food stores I need to check out. 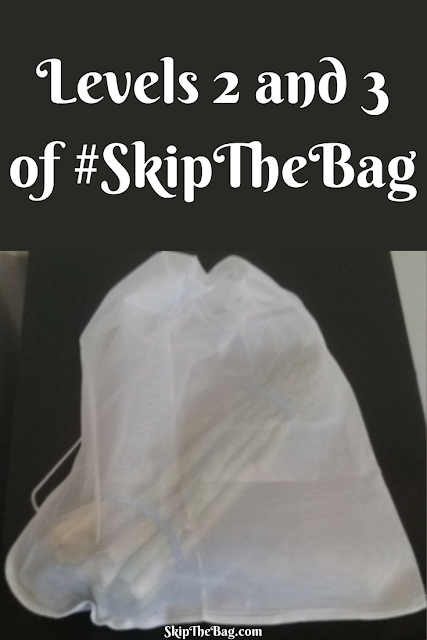 Which level of the #skipthebag challenge are you on? I always leave a few cloth bags in my four wheeler and two wheeler. Can't say when I will stop somewhere to buy some groceries. Great job! Always having them with you is a huge help. I carry some in my purse so I know I always have them with me. It seems like everywhere wants to give you a plastic bag! This sounds funny challenge! I use shopping bags, and if I need to buy extra bag, I take paper bag. Reusable bags for fruits is a great idea, we have them for sale in several local stores, but I must confess, that I have become a little lazy. When kids were small, we use to go to market and then I had my own boxes with me for every item I brought home. Sounds like you do very well! I'll admit, I was using reusable grocery bags long before I used the reusable produce bags...however they do come in very handy! It's so easy to get out of the habit, so that's why I try to keep them in my car or in my purse! I've been doing this awhile and I'm on level 3. I made a few bags from some scrap fabric and I use them at the store. I don't like having bags that all look the same, because then I have to try and remember what is in them. I have 1 bulk store that I shop at for dry goods and then I go to our local farmers market for fruits and veggies. I but potatoes, onions and some winter squash for the fall and winter to put in our root cellar. If you get mesh produce bags you can use them at any store. They can see through the fabric and identify it and they weigh 0.08 lbs. hardly anything at all. I'm not talented enough to make my own bags...well I guess I've never tried, so maybe I'm fantastic at it! Ha! I like the idea of having ones with different patterns. Congrats on reaching level 3! 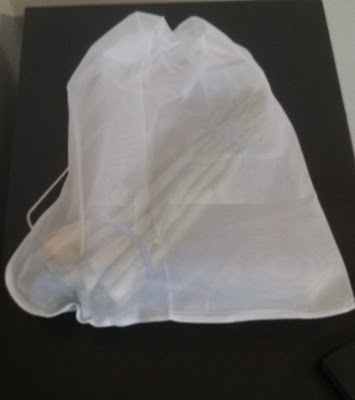 I made my own produce bags because I just needed more than the three bags that came in the package I picked up in the super sale isle at the grocery. Seems like no one knew what they were so they didn't sell, lucky me! I went through a bunch of fabric that my mom had and found actual flour sack material that my Grandmother had given her. Grandma would buy flour and rice in 50lb bags in the old days. She'd open the bags up to use the fabric for clothes for her kids or aprons for herself or maybe for a quilt. Well mom never used them for anything so I turned them back into flour sacks. Full circle!!! Mine are not 50lb bags, more like 2lb bags. Great for the bulk isle. I love that you were able to use fabric from your grandmother. It will be a great reminder of her every time you use them. Earth Day 1990 inspired me to start saying, "No bag, please," when buying just one item. I started using cloth shopping bags a few years later. I still haven't gotten into reusable produce bags, but I use the plastic produce bags over and over! Is there a health food co-op in your area? That's where I get my bulk food in reused containers, and they have a lot of great basic ingredients at reasonable prices!